lineHandles is a list of numbers, one for each line in your plot.2 These numbers are the "handles" of the plotted curves. In my undergrad's case, there are four curves, so lineHandles returns a list of four values. If you want to know what the properties are called, or what they're currently set to, you can run lineProps = get(lineHandles) for a list. For the plots we were changing, we wanted four blue curves to become a red, a green, a blue and a black curve, and we wanted to make the line thicker. The properties we needed were 'Color' and 'LineWidth'. We reversed the order of the colors vs. the order in lineHandles to match the pattern we wanted. I believe the ordering in lineHandles is based on the order the curves were added to the plot, but I don't know that for sure. 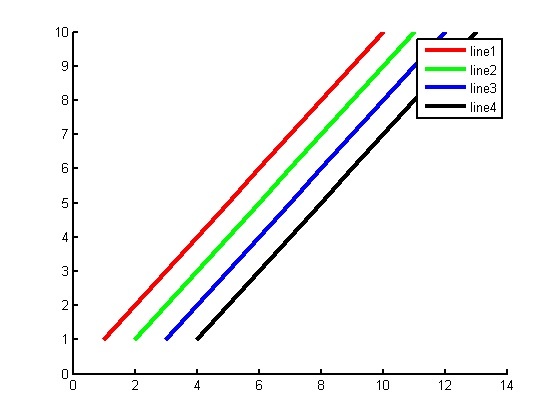 axisHandles would then have as many entries as there are axes in the figure. To get the particular set of axes you want, you'll need to pick the right integer for x. 2: I'm only addressing line plots here. The properties for bar charts are a little different.